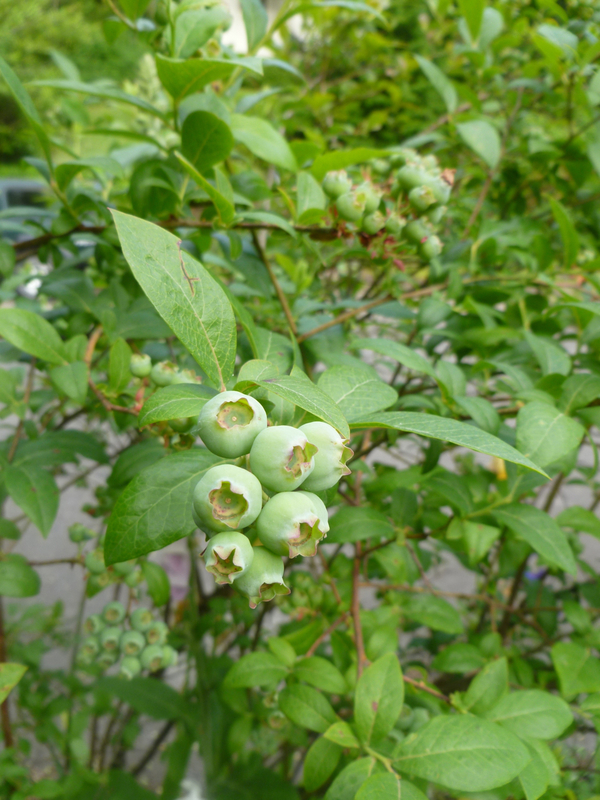 We are in countdown mode, counting down the days left in the school year, the hours left of grading exams, and the minutes until the sun will finally come out and start to ripen our summer fruit. 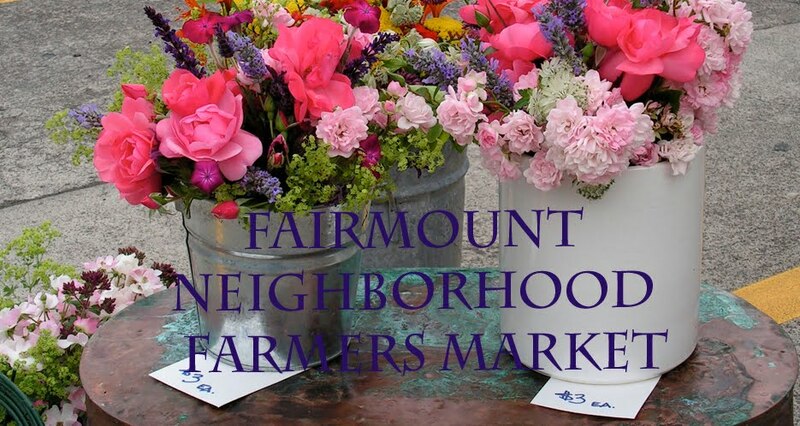 Although the last of these is hard to pin down, one date you can count on is June 19 as the start of the Fairmount Neighborhood Farmers Market. Come down to the corner of Agate and 19th between 10 and 2:30 to hear some laid back Gypsy jazz from Manouche Noir, and pick up some farm fresh produce from SLO Farm. Also this year there will be locally grown beans and grains (garbanzos, lentils, wheat berry, and flour) from Hunton Family Farm and Camas Country Mill, as part of the Southern Willamette Valley Bean and Grain project. Here's a great video about this project. One locally grown grain is buckwheat, which makes a great cover crop, but apparently has a limited market. 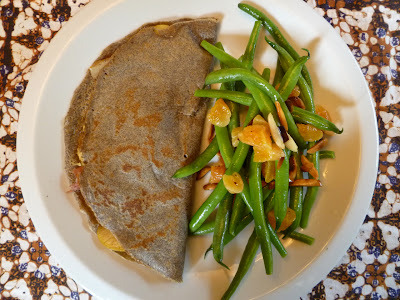 My favorite use for buckwheat is in savory crepes. 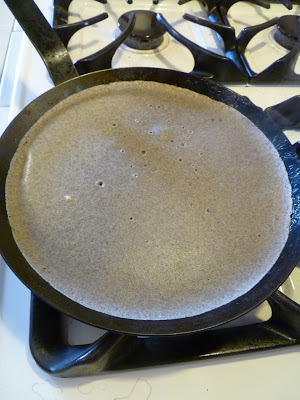 The buckwheat gives a heft to the crepes which makes them entirely different from dessert crepes and allows them to stand up to any number of filling one can scrounge from the fridge and pantry. Their versatility makes them a great weeknight dinner, and they are almost as quick to whip up as an omelette, especially if you make the batter in advance. We eat them in shift: whoever finishes the first round gets up to make the next. This time I used a buckwheat crepe batter recipe from thirschfeld at food52. Prep your fillings before you start making the crepes. 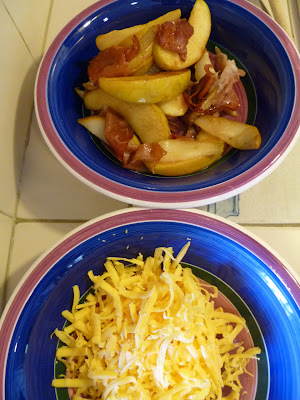 Here we sauteed apple slices in butter with some pieces of prosciutto, and grated some aged cheddar. Pour the crepe batter into a well-heated, buttered pan, and swirl to coat. When the batter has cooked so that it loses its pale color and develops permanent bubbles, flip the crepe and add the fillings. 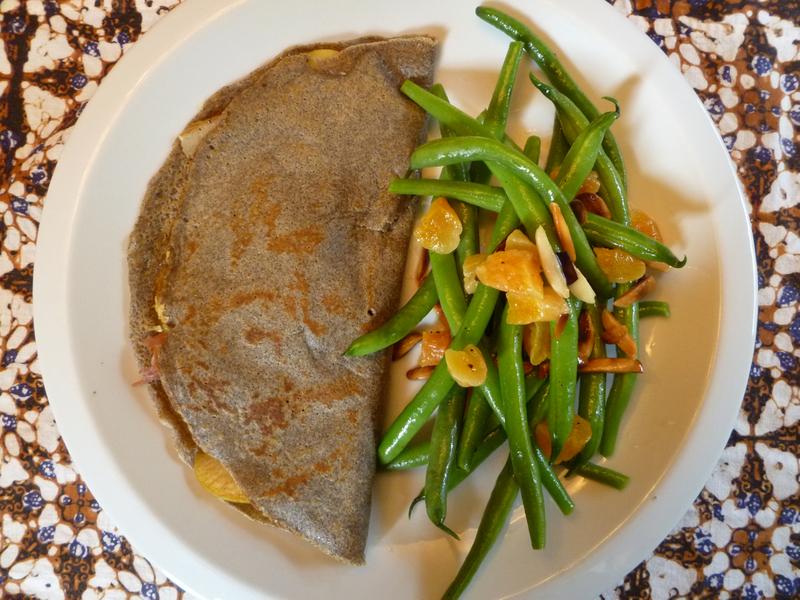 To accompany the crepes, I prepared a variant of another food52 recipe, this one from Amanda Hesser, of green beans with apricots and serrano ham. Because there was ham and apples in the crepes, I left these out of the bean dish and added some toasted almonds. I'm especially pleased to feature these food52 recipes because this week the site highlighted my recipes in their cooks spotlight. And I'm pleased to promote a local grain that deserves more followers. several handfuls of grated cheese such as aged cheddar or gruyere. 1. Prepare the batter. Combine the ingredients in a blender and mix until smooth. The batter should have the consistency of thick cream. It's best to let the batter rest for an hour or so before you use it. You can make it in the morning or even the night before your crepe dinner and if the butter separates out, just give it a quick mix. 2. Prepare the apple filling. In a crepe pan or skillet, saute the apple slices in ~1 Tbsp butter until they start to brown. Tear the prosciutto slices and saute with the apple for a couple more minutes and transfer to a bowl. 3. Wipe out the pan, melt a thin slice of butter and swirl to coat the pan. Pour in the crepe batter slowly while you swirl the pan so that it is just coated with batter. 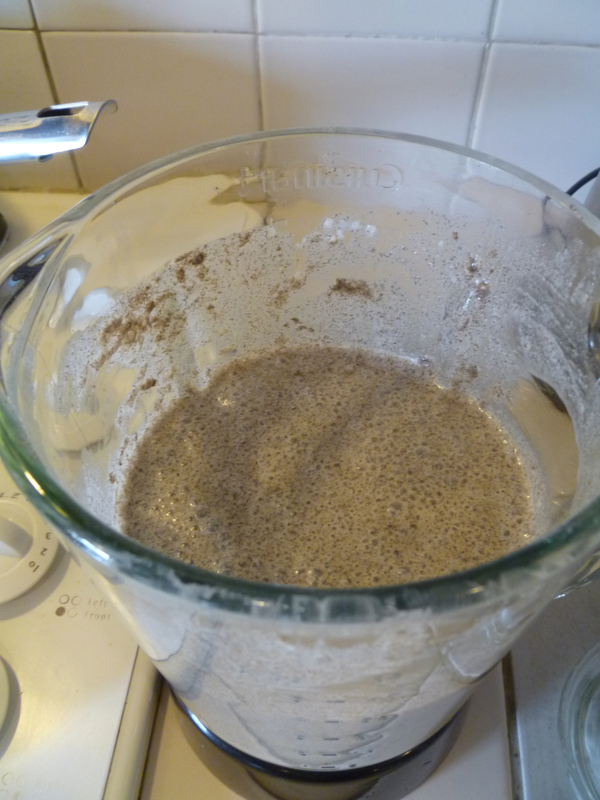 Cook until the batter loses its pale color and develops permanent bubbles. Secure a spatula under the crepe and flip with confidence. 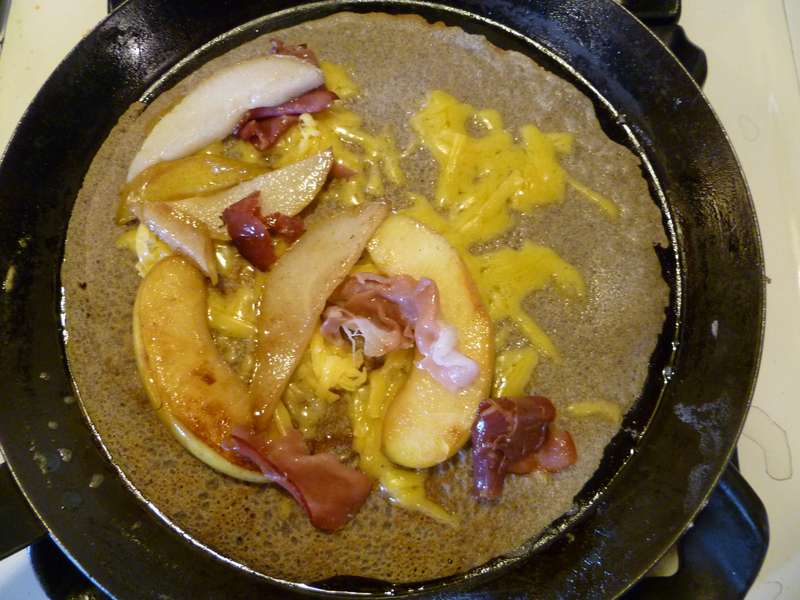 As the second side cooks, sprinkle a thin layer of cheese and apple and prosciutto toppings on one half of the crepe. Flip the naked half over the filling half and slide onto a plate. Eat while hot. Another fantastic looking recipe! You seem to know your way around a crepe! I need more practice.